[Czar] was working on a project with the Raspberry Pi using the MCP3008 analog to digital converter. The surface mount SOIC version of this chip was slightly cheaper, and there’s always a way to make that work (Portuguese, Google Translation). How [Czar] did it is fairly impressive, as it’s a bit more flexible for breadboard designs than a through-hole version, and done correctly, is an extremely sturdy hack. A few new leads needed to be soldered onto the SOIC package, and for this [Czar] chose jumper wires. This makes each pin easy to plug into a solderless breadboard, and since [Czar] was extremely clever, all the wires for power, ground, analog, and SPI are color coded. Simply soldering a few jumper wires onto a chip won’t last for very long. To solve this problem, [Czar] potted the entire chip and its connections with hot glue. Probably not the best solution, and a heavy-duty epoxy would have been better, but the current build is more than enough to stand up to the relatively minor abuse it will receive on the workbench. All it takes is one little seed. One tiny little seed, that when planted into the ground and nourished correctly, can flourish into a healthy and happy plant. But there are some challenges involved. For example, maintaining a steady temperature and keeping moisture at an optimum level can be difficult at times, especially when just starting out. This Arduino grow-op monitoring solution helps to solve those problems. It was built by [growershower] as a fun side project to monitor the vital signs of 3 marijuana plants. The board is an Uno and has an SD card shield with a DHT22 temperature sensor plus a soil moisture sensor. A photo diode is also used to measure light. [Dr. Fortin] teaches physics at a French High School, and to get his students interested in the natural world around them, he built a geomagnetic observatory, able to tell his students if they have a chance at seeing an aurora, or if a large truck just drove by. We’ve seen this sort of device before, and the basic construction is extremely similar – a laser shines on a mirror attached to magnets. When a change occurs in the local magnetic field, the mirror rotates slightly and the laser beam is deflected. 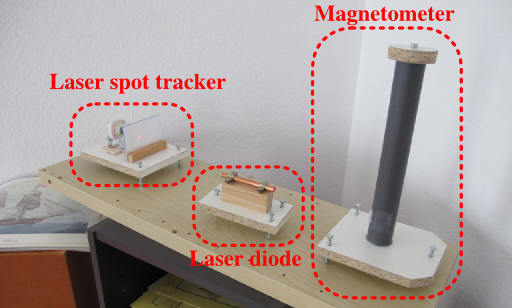 Older versions have used photoresistors, but [the doctor] is shining his laser on a piece of paper and logging everything with a webcam and a bit of OpenCV. The design is a huge improvement over earlier DIY attempts at measuring the local magnetic field, if only because the baseline between the webcam and mirror are so long. When set up in his house, the magnetometer can detect cars parked in front of his building, but the data he’s collecting (French, but it’s just a bunch of graphs) is comparable to the official Russian magnetic field data. Another week, another round of Astronaut or Astronot, the little lottery thing where we try to give away some fairly expensive tools to a random person on hackaday.io if they have voted for The Hackaday Prize. You should vote. Go here and do that. This week, the random hacker selected was [oscar6ojeda], but he did not vote. This means he doesn’t get a huge bench power supply. Oh well. I’ll send him a t-shirt and a few stickers. That’s fair compensation for doing nothing, right? We’re doing the same thing next week, so go here and vote. Voting in previous rounds doesn’t count, so you’ll only win the supply if you vote for The Hackaday Prize project with the most outrageous component.